So much for the consensus midterm election outcome being priced in: one look at global markets this morning shows a sea of green, and confirms that markets clearly like gridlock more than many had expected. After what was initially a muted reaction from financial investors in the United States and globally, European stock markets turned higher ignoring a mixed Asian Session with S&P futures following, gaining as much as 1% percent. A quick look at global markets saw Asian equities mixed, Europe solidly in the green, while in FX, the Indonesian rupiah, which soared the most since June 2016, led gains as the dollar weakened for the third day. South Africa’s rand jumped to the strongest in three months. Egyptian shares rose 1.5% and Turkish stocks gained 1.1%. Recapping last night's results, Democrats regained a majority in the House of Representatives while Republicans not only clinched control of the Senate but also gained 3 extra seats. And while the results will hamper Trump’s business-friendly agenda and could lead to uncertainty about his administration at a time when investors are already worried that a decade-old bull market may be ending, dimming chances for any major fiscal initiative from the administration that might have pushed yields higher and strengthened the greenback, so far stocks are enjoying a relief rally that the outcome wasn't worse. Indeed, the results for the GOP were no worse than investors had feared and point to a protracted political gridlock that had largely been expected by investors. That left investors free to buy back into a market that had its worst month in seven years in October. "Given what futures are pointing to right now, I think it’s probably a sign that on balance Republicans have marginally outperformed," said UBS global wealth management CIO Geoffrey Yu. "The big question from here is do we add risk. Given how weak markets were in October, there is a slightly stronger case for us to outperform in the short-term." As Reuters notes this morning, gridlock in Washington will all but eliminate the potential for more tax cuts, which Trump has called for and which many on Wall Street would like. The sweeping corporate tax cuts passed by the Republicans last year have supercharged earnings growth. It also means a lower debt deficit on net, lower yields and a lower dollar. And indeed, the greenback tumbled overnight even as risk assets jumped, with the Bloomberg dollar index sliding to a two weeks low after peaking at the start of the month. The BBDXY fell as much as 0.6% following the results of U.S. midterm elections, with the move gaining traction after the London open as short-term names added fresh shorts; the 10-year Treasury yield fell almost 5bps below 3.18%. The Democrats’ victory in the House could also benefit the market, some investors suggested, by tempering Trump’s aims such as on international trade. Indeed, the Democrats’ ability to prevent Trump from passing new laws may push him to focus more on resolving U.S. disputes with China, although that wasn't obvious to Chinese stocks, with the Shanghai Composite one of the few indexes closing in the red, and near session lows overnight. Some investors were hopeful that Republicans and Democrats could agree on spending to improve infrastructure, which could boost many companies’ profits and drive more economic expansion. In any case, investors will be happy just to move on from the elections: "It’s one less thing that’s in front of you that you have to worry about,” said Greenwood Capital CIO Walter Todd. And with the elections now in the rearview mirror, the biggest macro themes remain the Fed's ongoing interest rate hikes and the trade war after recent warnings from major names including Christine Lagarde and Former U.S. Treasury Secretary Hank Paulson. Meanwhile, the Italian government is holding a confidence vote on Wednesday, the Federal Reserve is set to decide interest rates on Thursday, and Theresa May is pushing on with efforts to agree a Brexit deal. Elsewhere shares of Spanish banks surged after the local Supreme Court ruled they don't have to pay back billions of euros in back taxes. The euro rallied as data showed German industrial output picked up steam in September. Asian equity markets traded cautious as all focus centred on the US mid-term election results. A strong start for the Democrats weighed on US equity futures in early trade, although stock futures then recovered after further results and projections trickled in which suggested the unlikelihood of a Blue Tsunami (Democrat-controlled House and Senate) as the Republicans won in key Senate battlegrounds such as Indiana and tightly-contested Texas. As such, there was a non-committal tone in most Asia bourses with ASX 200 (+0.4%) and Shanghai Comp. (-0.7%) choppy, while Nikkei 225 (-0.3%) was initially bolstered by recent favourable currency moves before dipping into the red. Hang Seng (+0.1%) briefly outperformed amid a tech-led surge, before slipping into the red. Finally, price action in 10yr JGBs reflected the non-committal risk tone as participants second-guessed the election results and amid jittery trade in T-notes. 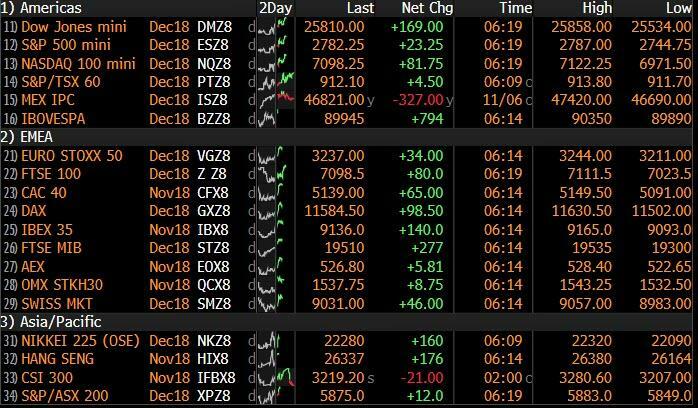 European equities are positive across the board as investors digest the consequences of a split Congress, with US equity futures edging higher as some traders see the Democratic House majority as a prospect for trade policies to be reeled in slightly, albeit a lot of powers will still be retained by Trump. It is also worth noting the split Congress may translate to less fiscal stimuli as US tax reforms would face greater obstacles when passing through Congress. Going back to Europe, sectors are largely experiencing broad-based gains, while IT names lag. Spain's IBEX outperforms as banking names (Caixabank +3.8%, Sabadell +2.9%, Santander +2.8%, BBVA +2.4%) benefit from reports the Supreme court ruled that banks are not required to pay mortgage stamp duty, which saves the banks from potentially having to reimburse billions of EUR to borrowers, although source reports noted that the Spanish government is to propose a law change so banks pay mortgage stamp duties, which contradicts the ruling. In terms of individual movers, Adidas (-1.9%) is the laggard in the German benchmark after revenues missed expectations, while Fresenius Medical (+9.0%) and Mediclinic (+5.0%) rose to the top of their respective indices after voters in California rejected a proposal to cap profits on dialysis companies. In currencies, the DXY saw a relatively marked retreat in the index amidst broad Greenback losses in wake of the US mid-term elections, as currency markets factor in the prospect of policy protraction and a more difficult passage for President Trump’s fiscal agenda through a divided Congress. The DXY has lost grip of the 96.000 handle and also breached pre-NFP lows to test support/underlying bids around 95.700. CHF/EUR/AUD/GBP - Also firmly ahead vs the Usd, with the Franc back above parity and almost testing 0.9950 resistance despite latest SNB assurances that an accommodative and proactive stance is necessary due to fragile FX moves. The single currency has put aside persistent Italian budget concerns to clear some key upside technical levels, including 21 and 30 DMAs (1.1453 and 1.1479 respectively) to test a Fib just a fraction below 1.1500 where a whole host of orders are anticipated ranging from stops, option expiry and barrier hedging. The Aud is partially piggy-backing its antipodean counterpart, as the cross holds above 1.0700, but also extending post-RBA gains after upgrades to the 2018 and 2019 growth outlooks to probe offers/resistance ahead of 0.7300. Meanwhile, Cable continues to climb on Brexit hopes as well as the indirect bid via Buck weakness, and has now advanced above 1.3150 to circa 1.3175. JPY/CAD - Both lagging other majors amidst the post-midterm Dollar demise, but still well ahead and rebounding from recent lows around 113.00 and 1.3075 respectively, with the Loonie also benefiting from a recovery in oil prices amidst reports that Russia and Saudi Arabia may discuss crude output cuts in 2019. EM - Everyone’s a winner vs the increasingly down-trodded Usd, and even the Rouble that could yet face more US sanctions – Usd/Rub sub-66.0000. Looking at the day ahead, much of the focus will likely be spent digesting the midterm results especially with the data on the light side. This morning in Europe it’ll be worth keeping an eye on the September industrial production print in Germany while UK house price data for October and September retail sales for the Euro Area are also due. In the US the only release of note is September consumer credit this evening. Away from that, EU trade chief Cecilia Malmstrom is due to make a speech in Brussels today while Russian PM Medvedev is due to meet Chinese Premier Li Keqiang in Beijing. Straight to the main event this morning where the US midterm election results have mostly fallen in line with results indicated by polls, with the Democrats looking set to gain control of the House of Representatives but the Republicans retaining control of the Senate (and even potentially gaining 3 seats) according to all the major media outlets. It seems at the moment that the results have been broadly in line with what you’d expect given the President’s approval rating. There wasn’t a big blue wave but we will have a split Congress. A couple of hours before we went to print it was actually looking close in the House before the Democrats pulled away. As for what markets have done, on net, moves have been orderly, though there were some sharper moves overnight when it looked like the Republicans might in fact retain control of both chambers. S&P 500 futures rallied as much as +0.56% around 3am GMT, but are back to +0.25% now. Similarly, the dollar swung from a +0.15% gain to -0.37% as we go to print. 10y Treasury yields are also now down 3.9bps to 3.186% however that was after touching a high of 3.2501% which in fact is higher than the closing high made back in October – which is also a seven year high. So a decent swing. In Asia we’ve also seen bourses advance including the likes of the Shanghai Comp (+0.26%), Hang Seng (+1.17%), Nikkei (+0.55%) and Kospi (+0.22%). Yesterday’s session is a bit of an afterthought now but for completeness we did see Wall Street finish on a strong note, albeit on lighter-than-usual volumes. The NASDAQ fully reversed Monday’s loss to close +0.64% while the S&P (+0.63%) and DOW (+0.68%) also advanced into yesterday’s close with healthy gains. Mixed comments from China’s Vice President Wang Qishan about China reaffirming a desire to “work for a solution on trade acceptable to both sides” but also not to be “bullied and oppressed by imperialist powers” seemingly had little impact on sentiment. The same cannot be said for oil, where WTI and Brent slumped -1.41% and -1.42% respectively after the US issued temporary waivers to eight countries on purchases of Iranian crude. Treasuries (10-year +2.7bps) edged higher and to within half a basis point of that seven year high - which is impressive given the recent risk off – although as we’ve seen above they’ve rallied back overnight. Prior to that, European markets just failed to clamber back onside having spent the majority of the session in the red. The STOXX 600 (-0.26%) notched up a second consecutive modest decline while the DAX and FTSE MIB ended -0.09% and -0.07% respectively. Bunds sold off +0.8bps, while BTPs underperformed (+7.2bps). The final October services PMI revisions were the highlight of the morning session, with the big headline being the outsized miss for Italy (49.2 vs. 52.0 expected). That represented a drop of 4.1pts from September and was also the first sub-50 reading since May 2016. That sent the composite down to 49.3 and a 59-month low, however the wider Eurozone composite print was revised up 0.4pts to 53.1 after Germany’s services print was revised up 1.1pts to 54.7. Italy was really the only real negative in October, as European growth looks much less synchronized than it did last year. On the positive side, however, Italy’s idiosyncratic weakness has not been contagious as yet. Away from that, German factory orders rose +0.3% mom in September, with the August figures revised higher as well. That’s consistent with our economists’ expectations for 0.0% German growth in Q3 but a bounce to 0.3-0.4% qoq in Q4. The only data in the US yesterday was the September JOLTS report. Job openings declined slightly (to 7.01m from 7.29m in August) however the overall quits rate and the private quits rate held at 2.4% and 2.7%, respectively, matching their highest levels since 2001. Our US economists note that this data leads ECI wage growth and points to the ECI rising to 3.4% yoy by mid-2019 which, if realised, would be the highest level of the cycle. The British Pound bounced between gains and losses yesterday but ultimately rose +0.44% amid a slew of Brexit-related headlines. The CME group announced that it is moving its eur-dominated bond and repo trading hub to Amsterdam to address potential “hard Brexit” uncertainties, while Prime Minister May is reportedly preparing to seek cabinet approval to a new draft Brexit deal. Press reports (like Bloomberg) suggested that a full Parliamentary vote could come as soon as 19 November. Ultimately, these headlines do not change the fundamental situation, where a solution to the Northern Ireland border remains the key sticking point. The DUP leader was quoted as saying that if the rhetoric goes in the current direction we’re heading for a no-deal. That’s a worry for PM May as it indicated the DUP aren’t best pleased with the current shape of the deal and without their support that chances of getting a deal through Parliament are more limited. It would also raise the prospect of an early general election if relations between the Conservatives and the DUP broke down completely as a result. Having said that cable is back above $1.31 having traded at $1.27 only a week ago. As far the day ahead, much of the focus will likely be spent digesting the midterm results especially with the data on the light side. This morning in Europe it’ll be worth keeping an eye on the September industrial production print in Germany while UK house price data for October and September retail sales for the Euro Area are also due. In the US the only release of note is September consumer credit this evening. Away from that, EU trade chief Cecilia Malmstrom is due to make a speech in Brussels today while Russian PM Medvedev is due to meet Chinese Premier Li Keqiang in Beijing.